Around 100 firefighters and 15 fire engines tackled a blaze in the early hours of this morning at a block of flats in West Hampstead. No-one was injured but 50 people were evacuated from the five storey block on Inglewood Road. The fire broke out at around 1am and could be seen from across North West London. LFB Station Manager, Claiton Murray, said there were concerns the roof could collapse so residents were evacuated from the top floor. Fire crews also assisted two people from the first floor while a number of other residents fled from lower floors. Some residents were able to take refuge at the nearby Black Lion pub which opened to help those affected. It's believed the fire at the Victorian block began on the fourth floor. 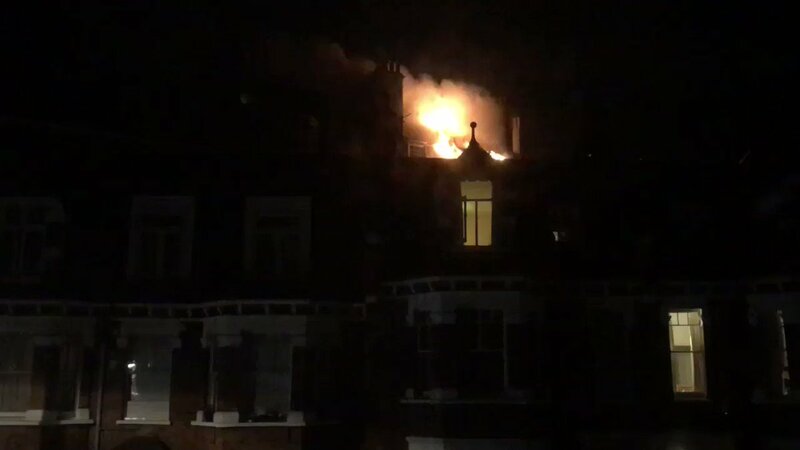 Firefighters from West Hampstead as well as surrounding stations were at the scene and took around four hours to bring the flames under control. The cause is now being investigated.